Any emerging startup with a bold, innovative product can be held back by a lack of attention or focus on design. Andy Budd is a UX designer and CEO of Clearleft, a digital design agency based in Brighton, England. He took to the stage at The Next Web Conference today to deliver a keynote on the importance of design and how technology companies should position these creative minds at the center of the product. So why isn’t every startup doing this already? The problem centers on money and the pressure to build a product with as few people as possible. He suggests that startups hire “a few really good designers” at an early stage to set the initial vision and groundwork, as this will attract better talent down the line. Startups can also struggle to hire high-quality designers because their company website looks sub-par or is misrepresentative of the company ethos and vision. TNW caught up with Andy Budd after his speech to discuss the importance of design, the lack of user experience designers in the UK and much, much more. Tonya Peck At DMI’s June, 2010 event in San Francisco, “Re-Thinking the Future of Design,” Darrell Rhea and Roger Martin continued their conversation from 2009 exploring Integrative Thinking and its sibling Design Thinking. It was an alluring conversation, surely: if we just “think different” we could finally solve the myriad complex and systemic issues currently confounding corporations and communities. Roger’s book, The Opposable Mind, offers us his four-step process for Integrative Thinking. Richard Florida, Roger’s colleague at the Rotman School of Management, paints a related and irresistible picture of urban renewal and recovery achieved by attracting “high bohemians” (the very people predisposed to integrative thinking). And Dan Pink has popularized the notion that right-brained creatives would soon remake the world into a better place. Under-employed left-handed architects, your time has come! Certainly, integrative thinking and design thinking hold a lot of promise. But will these methods lead us to the effective solutions our corporate and community sponsors require, and the authentic connections with customers we hope to create? And will we realize a future of design that includes the increased impact we seek? I believe the answer is “Yes, yes, and…” Yes, these methods can be effective. Yes, they can drive impact. And they could drive more impact if we apply the behaviors that they require to ourselves and not just to external problems and research subjects. It’s not sufficient to think different, we must be different by demonstrating compassion, curiosity, openness, a comfort with ambiguity, and an unconditional positive regard for our experiences with one another. Let me demonstrate this reasoning using Roger’s four-step process. 1. Salience In the last decade, design as a function, an awareness, a differentiator, and a strategy, has grown from niche and premium markets to the mainstream, the classroom, and the boardroom. Yet scenarios like the following remain all too common. Imagine you’re in a review meeting presenting concepts for a new hand-held consumer device experience. You’ve pursued your work with the utmost fidelity to the principles of Integrative Thinking. You’ve guided your design team through the ambiguity of the diverge/converge cycle, helped them remain curious and empathetic towards their research subjects, and now you’ve pulled together your concepts and scenarios into a pitch. Around the table your colleagues from marketing and finance sit, including a few in possession of hybrid design/MBA degrees. You notice a few behaviors in the room that drive up your anxiety. One colleague has their head in their laptop triaging email. Another flips quickly through your artifacts quickly before quizzing you on basic principles. A third wants to jump to the question, “how much will it cost?” Your stomach flutters, your heart-beat races. You never get to present the customer personas on which your team iterated so hard. You feel yourself losing traction in the room. What’s happening here, and how do you handle it? More importantly, have you been trained to handle an experience like this? Do you and your colleagues around the table have a common language and skillset for pausing and parsing this experience in the moment? Are you able to detect, differentiate, and articulate the thoughts in your mind from the feelings in your body? Can you sense the reptilian urge within yourself to fight or flee while at the same time, feel sufficient empathy for and curiosity about your colleagues? In short, do you have what it takes to direct this potential conflict into an opportunity for collaboration and learning? And, to raise the stakes even higher, could you do so if these colleagues were not internal colleagues, but clients instead? 2. Causality This scenario strikes at the heart of the challenge many design groups face when shepherding their ideas to market. It may not be our designs, or the method by which we develop them, that fails. It may be our behaviors, because we’re under-equipped to navigate the group dynamics that emerge when diverse mindsets meet. We don’t own this challenge exclusively, but as designers, I believe we experience it acutely because our work, our role, our very way of being, is often that of the change agent. In the decade it took for the influence of “think different” to grow from an inspiring Apple ad campaign into a multitude of mainstream MBA programs and BusinessWeek articles, three parallel developments emerged in science and society. Let’s diverge for a moment to explore them. First, brain research has revealed that our limbic brains, the middle portion of the brain that regulates our internal state, also regulates and is regulated by other limbic brains. Like computers, we are more powerful when connected, and less so when that connection is weak or breaks. Research by Daniel Siegel has demonstrated the impact of early childhood on our ability to connect. The very organ we expect to perform design and integrative thinking grows from birth in response to the forces of feelings and connections with those around us. Children raised in unconditionally loving and supportive environments are more likely to grow up into adults with healthy limbic brains capable of curiosity, emotional resilience, empathy, and adaptability; traits necessary to manifest the behaviors of integrative thinking. Second, our awareness and acceptance of diversity, not just of thinking different but of being different, has evolved in the last decade. What we once defined as a list of demographic descriptors that influence human resources and hiring practices (what I call ‘little d’) has grown to include our rich variations in perceptual, cognitive, learning, communication, behavioral, and conflict management styles. Taken together, it’s these diversity factors (what I call ‘big D’) that likely have a more significant impact than ‘little d’ on the experiences we have with others, on the effectiveness of our teams, and on the level of innovation we can deliver for our customers. Third, the dynamic that has emerged since the late 1990’s is the acceptance that emotional intelligence (EQ) becomes a more significant factor in leadership effectiveness and career success the higher one advances. Cary Cherniss’ paper “The Business Case for Emotional Intelligence” (Rutgers University) offers numerous case examples from industry and the military in which positive organizational improvements occurred after hiring and promotion practices began filtering for the various competencies of EQ. The technical skills that once differentiated us as a field have become, like many other fields, common. And what we previously dismissed as ‘soft skills’ we now understand to be the harder, and more necessary, skills to practice. I believe these developments hold important information for us as a field. How can we hope to create emotionally resonant products, services, and experiences for customers if we struggle to connect with each other? It’s not enough to adopt or promote a different way of thinking, whether design, integrative, critical, contemplative, or otherwise. We must leverage our role as change agents by bringing our full self, both our thoughts and our feelings, into the room in service of connecting with our colleague’s limbic brain to limbic brain. This requires that we apply the behaviors of compassion, empathy, curiosity, iterative learning, and unconditional positive regard to ourselves, our colleagues, and our experience of each other in the moment. If you were the design manager in the pitch meeting scenario above, you might feel drawn down the easier path of caving in to cost questions and crunching another spreadsheet. The harder path would require marking the behaviors you observe in the room, sharing their impact on you, and inquiring positively into whether that impact is what your colleagues intended. 3. Sequencing So where to begin? How do we equip ourselves to take the harder path in the pitch meeting scenario? What does it take? In a conversation with John Maeda, President of the Rhode Island School of Design, he suggested we must discard the archetype of the designer-as-supplicant in favor of the designer-as-leader. But how? I’ve been exploring leadership behaviors in the design field since joining Microsoft in 2002. Back then, the corporate environment was aggressively left-brained, and the whole community of designers fit into a single large meeting hall. Our collective narrative about life in the company often touched on themes of feeling “undervalued,” “lacking a seat at the table,” and “only called in at the last minute to make the product pretty.” I observed myself and my peers becoming risk-averse when conflict emerged, and we probably missed a few creative opportunities along the way as a result. In truth, I failed the pitch meeting scenario myself a few times before recognizing I had to develop my leadership skills in order to succeed. And after several years advocating we do so as a community, I was offered the chance to give it a try. In 2007 I began creating Microsoft’s first leadership development program for user-experience designers and researchers (UXLP). I condensed topics and techniques from my own graduate studies in applied behavioral science (a form of organizational development) into an eight-month long experiential learning program. I asked managers to sponsor participants they perceived to have emerging leadership qualities. We launched the program in January of 2008 with 18 attendees at an intensive three-day off-site based on Kurt Lewin’s T-Group method. We taught them the core skills of differentiating, articulating, and inquiring into their thoughts, assumptions, wants, feelings, and intentions. We taught them how to observe the unfolding group process from a systems perspective, how to track their own reaction patterns, and how to broaden their range of response flexibility. In our subsequent one- and two-day sessions each month we returned to the T-Group format and layered in additional core concepts from the field of organizational development. We reinforced the core concepts via project-based learning, with attendees working in sub-teams on ways to strengthen Microsoft’s design community. And we encouraged participants’ managers to attend key sessions so they too could practice skills like giving and receiving behaviorally-specific feedback in the safety of our “learning lab.” At the graduation ceremony, several managers shared their experience of participants’ increased leadership effectiveness over the course of the program. And several participants reported the impact the program had on their effectiveness in their wider lives outside work. We’re now ramping up our third class of UXLP participants, and the response continues to be very positive. Recent attendee feedback includes: “I learned a lot about how I react to certain behaviors, and how others react to mine.” “I believe in the value of open communication. But in this program I really learned how conflict can signal an opportunity for learning, and how the specific behavioral choices I make can either close down communication, or open it up for that learning to emerge.” “My experience in this program has taught me that we judge ourselves by our intentions, but we judge others by their behaviors. This paradox of team life makes it incumbent upon me, when I’m confused or activated by their behavior, to check my assumptions about their intentions.” Many UXLP participants have also expressed frustration about “why wasn’t I taught these skills in school?” As I’ve begun sharing the UXLP story with academic design programs, I’ve heard similar reactions among the students. While addressing a recent class at the University of Washington, one graduate student made the connection between leadership development and his career prospects. “An employer is going to expect me to lead like this,” he said. “If I walk in with just my Masters-level technical design skills, I feel underequipped.” 4. Resolution Tim Brown, President of IDEO, describes Design Thinking as “not only-human centered” but as “deeply human in and of itself.” In this light, the true gift that Design Thinking and Integrative Thinking have brought us is not some innovative thinking methods, but in the shared vocabulary and causal wisdom we now have to use with each other. Similarly, the “way of being” I’m suggesting we adopt here, bringing our thoughts and feelings into the work of design, is not new. Carl Rogers first described it in his 1961 book On Becoming a Person, and his student Roger Carkhuff expanded on several of the practicable skills required to manifest it. Peter Block, during his keynote address at the annual OD Network Conference 2009 in Seattle, defined the work of organizational development as “restoring humanity to the places that have so de-humanized us in pursuit of process, performance, and profit.” As a designer, this resonates for me as well. And I believe it’s in this direction that we, as individual designers and as a field, must grow in the future. Biography: Tonya M. Peck has, for over 20 years, focused on building and leading effective product design and development teams in the US, Europe, and Asia. Last year she shifted her professional focus to the organizational development of product teams, and recently delivered the largest learning program in the history of Microsoft’s Windows division. She is eager to hear from other members of the DMI community exploring similar ideas, and can be reached via tonyap@microsoft.com. This article appeared in the September 2010 edition of the DMI News & Views. Copyright © 2010 Design Management Institute All Rights Reserved. No part of this work may be reproduced in any form without written permission from the copyright holder. 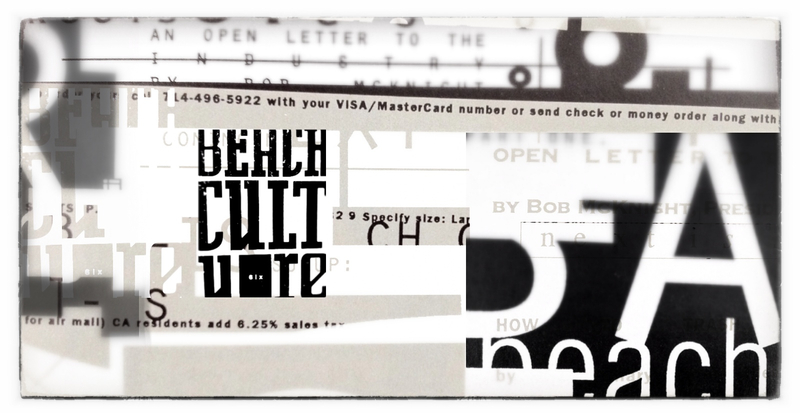 I GOT INSPIRED BY DAVID CARSON’S WORK AND CREATED THIS COLLAGE IMAGES. 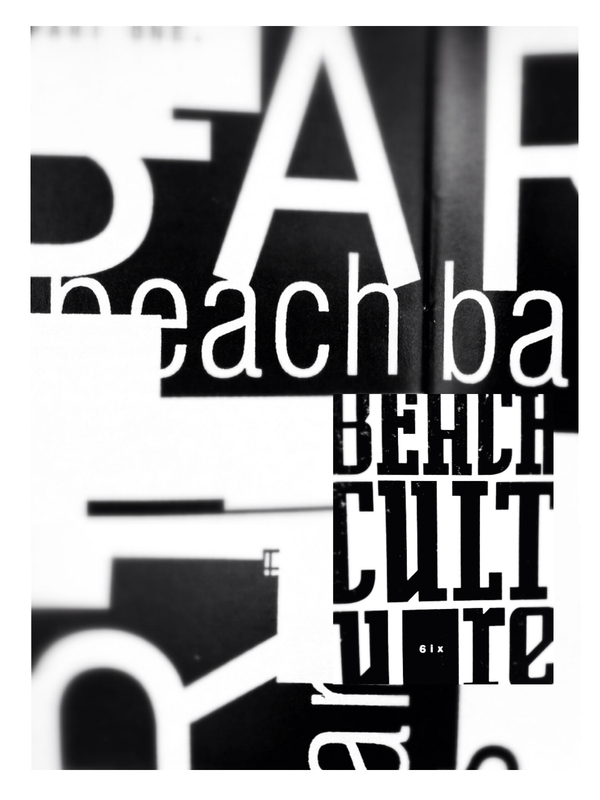 Back in the day (1991), while I was studying graphic design at the university, I found the 6th issue of beach culture’s magazine. I got astonished by this completely new approach and usage of typography. All the black and white spaces, all the typos sliced, cuted and still building a visual story… A whole new visual proposal was in front of me. I have never seen something like that. A few day later I had one of my first brochure design requests and yes I was really influenced by it, for sure. All kind of questions raised, how they came up to that idea?, how composition works on such a free style?, how i can find joy in such an irreverent space?. I just loved the feeling and my posture was, Even I love it, I will not copy it. I will find my own personal expression. Time passed by, I did continue my design practice which I still manage to do so, and experience started to show me all those big names of all those great designers that I knew only by the work they have made, and David Carson was no exception. A couple of days ago with no reason at all and while I was working, I just stop, my ADHD appeared, I stood up, look for my Beach Culture magazine copy, opened the issue and lived that emotion again. That thrilling emotion that innovation delivers. What made me stop and look for it is still a mystery, one od those special moment that only attention deficit can deliver but instead of looking for an answer, I got my iPhone and capture the pages that I do remember shocked me, a day after I started a 3 piece collage composition inspired on those images. So here they are to be shared to all of you. A glimpse moment, an influential moment of one of the most important change players in contemporary design. 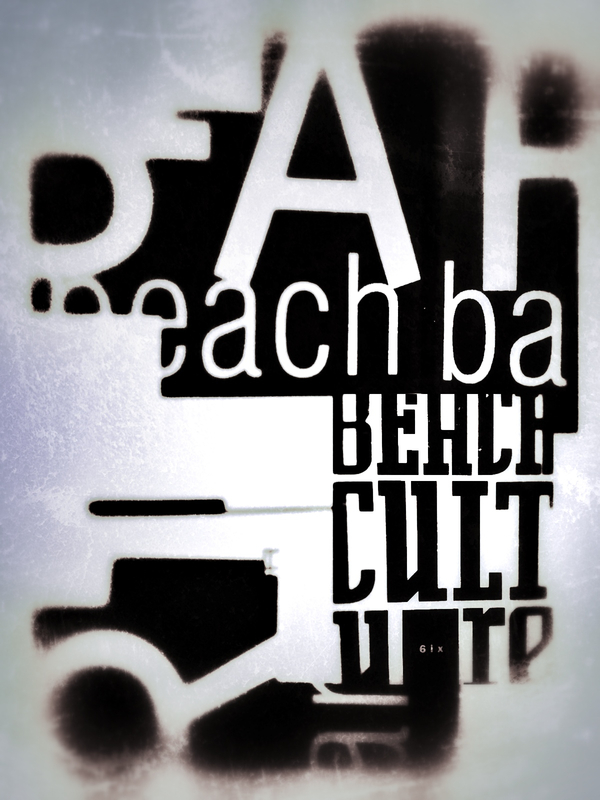 My personal tribute to David Carson’s number 6 issue of beach culture magazine* that amazed me by the first time. Yes, it has been more than 20 years since I started to design and I do love that special emotion of discovery, of known influence, and of course of unconditioned creation. Long life to the free spirit that may raise in all of us ’cause of so many talented people. Thank you all! I do care 4 design. *My creation upon this 3 piece collage has no intention other than to recognize David Carson’s work and influence in my life as designer. It has no commercial intention other than to contribute to DC relevant work, worlds cultural development and the importance of great design contributions to society in so many ways, all farther than just the aesthetics. For some time, I have been making my shot collections. Basically divided in two sets. Here they are. Visit the links below for full galery. Happy Monday Morning to all!